In my experience, most of the boardshorts from the various companies are fairly similar to each other in terms of materials and technology. They mostly differ in style and design, and when one company figures out something new, the others usually catch on pretty quickly. 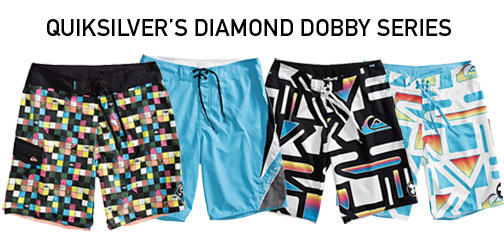 I wonder if the other brands will start producing boardshorts similar to Quiksilver’s new Diamond Dobby boardshorts, because I think Quiksilver is on to something big. I have heard a lot of people say the Quiksilver Diamond Dobby boardshorts are the most comfortable boardshorts they’ve ever worn, and that they feel completely different than normal boardshorts. I purchased a pair of Quiksilver Diamond Dobby boardshorts last week to see what the hype was about, and so far, I have spent about 18 hours in total surfing in them. I won’t say that wearing the Diamond Dobbys is a life-changing experience, but they are noticeably more comfortable than my other boardshorts. I really like them a lot, and hope that Quiksilver and other brands continue with this technology. When you look at the inside of the Quiksilver Diamond Dobby boardshorts, you’ll see a bunch of really small diamond shapes stitched in a pattern. These slightly raised diamonds make it so a lot less fabric ends up touching your skin. This makes for a very comfortable feel, and helps prevent rashes. The fabric is very thin and lightweight, adding to the comfort level. Diamond Dobby boardshorts also dry extremely fast. Currently Quiksilver makes five styles of boardshorts with this technology. They made different lengths and designs so that no matter what your preferences are, you should be able to find a pair that works for you. The Cool Out’s are 20 inches long and come in bright colors and black and white. The Reflex’s and the Mega Bleeker’s are 22 inches long and have both bright and semi-conservative colors and designs. Last of all the Tunnel Vision’s and the Blendid’s are 19 inches long, featuring extreme and conservative colors and designs. I love these boardshorts and would recommend them to anyone. They really are the most comfortable boardshorts I have ever worn. Check out this video clip from Quiksilver and hear what the team riders have to say about their new Diamond Dobby boardshorts.